In different circumstances, Callum Hudson-Odoi’s goal against Sheffield Wednesday at the weekend would have been celebrated by all at the club. A great goal, made in Cobham. The 18-year-old’s neat take, skilful touch and finish to Andreas Christensen’s floated pass in Sunday’s 3-0 FA Cup win would normally have been cheered as the ultimate validation of more than a decade of work by Chelsea’s academy. But those who toil within the club’s youth setup — across the road from the first-team building — know all too well that even the most joyous Stamford Bridge moments conjured by their brightest graduates tend to be bittersweet. Hudson-Odoi cannot say it publicly but he wants out — Bayern Munich wants him — and Chelsea are on the verge of a disaster largely of their own making. Jadon Sancho’s meteoric success at Borussia Dortmund is a nightmare for all top Premier League clubs attempting to preach patience at their loaded academies, but has particular relevance here; Hudson-Odoi is his friend, his peer and, crucially, regards himself as at least his equal in terms of talent, having regularly bested Sancho’s former club, Manchester City, at youth level. Bayern, stung by missing out on Sancho to their biggest domestic rivals, are now determined to sign their own English wunderkind. It is hard to imagine a more enticing pitch to a top young talent, and easy to see why Hudson-Odoi, in particular, has been swayed. Yet Chelsea cannot blame their predicament entirely on the perfect Sancho storm. No one who saw Hudson-Odoi destroy Arsenal’s Hector Bellerin during a preseason friendly last August would have guessed he would wait until Boxing Day for his first Premier League appearance of the campaign. In fact, he hadn’t even appeared on the bench until that game, his first-team involvement limited to the Europa League and Carabao Cup. That period of almost five full months yielded a grand total of 215 minutes in cup games and reportedly confirmed to Hudson-Odoi and those close to him that Maurizio Sarri did not consider his development a priority. Some relevant context: Alphonso Davies, the 18-year-old Canadian who completed a £16.66 million move to Bayern from Vancouver Whitecaps earlier this month, made his Bundesliga debut on Sunday in a 4-1 win over Stuttgart. Sarri had his reasons. He came to Chelsea less than a month before the new season, charged with implementing a radically different style of football while returning the club to the top four. When time is short, the stakes are high and the margins are fine, proven pedigree tends to win out over potential. Consequently, Chelsea’s charm offensive only clicked into gear once Bayern’s interest in Hudson-Odoi became widely known. He has enjoyed almost as many first-team minutes in the last month (209) as he did in the previous five, though Sarri’s trust has yet to translate to a Premier League start. 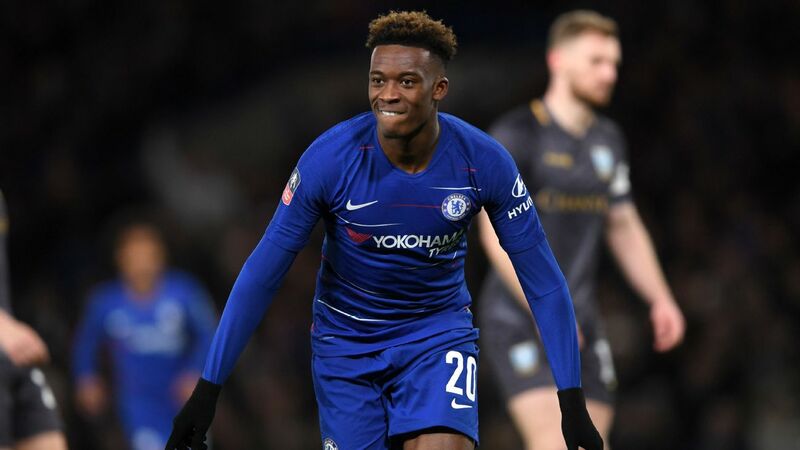 If they do resist Bayern beyond Thursday’s deadline, Chelsea’s hope will be that Sarri can elevate Hudson-Odoi enough over the rest of the season to change his mind. That seems unlikely, given that Gonzalo Higuain’s arrival pushes Eden Hazard back to the left wing, leaving the wantaway 18-year-old competing with Willian and Pedro Rodriguez for a place on the right. The present is also holding back the future elsewhere in Sarri’s squad. Centre-back Christensen is growing restless behind David Luiz, a 31-year-old who is almost out of contract. Ruben Loftus-Cheek has found his central midfield hopes impeded by the on-loan Mateo Kovacic, a player being kept warm for Real Madrid. His most regular first-team chances have instead come on the right wing, at the expense of Hudson-Odoi. In the wider context, Chelsea telling Hudson-Odoi to be patient lacks credibility. There was a time not so long ago when Dele Alli was less heralded than Loftus-Cheek, and Dominic Solanke has rated a superior prospect to Marcus Rashford. Stardom is only achieved when talent meets with opportunity. Hudson-Odoi can find no shortage of cautionary tales among Cobham’s recent alumni. Hudson-Odoi has no reason to trust that committing to Chelsea will boost his chances there. Nor does he have cause to be confident that Chelsea will not buy another player like Christian Pulisic to block his path. The mindset of many elite clubs ensures that big-money signings will always be given every chance to succeed over academy products, or even — as in the cases of Alvaro Morata, Tiemoue Bakayoko and others — every chance to fail.If he joins Bayern, Hudson-Odoi will be the big-money signing, not the academy product. His new club will immediately be more invested in the fulfilment of his potential than his old one ever was. He and those around him are smart enough to know that, which is why it may already be too late for Chelsea. In financial terms, getting £35m or more for a home-grown product is a remarkable success. Yet the thousands who chanted “Hudson-Odoi, we want you to stay” at Stamford Bridge are not moved by the bottom line. The whole point of an elite academy to a club like Chelsea is to unearth and refine a talent of Hudson-Odoi’s calibre; if he is allowed to slip away, the entire project will be questioned like never before.